Somewhat like Captain Jack Sparrow, the Hawke Optics 1×32 Multi-Purpose scope easily adapts to all sorts of situations. Originally designed as a crossbow optic, people quickly realized that it was fit for more combustible applications. As I’ll show in more detail, it has 3 easy-to acquire aiming points which you can use to identify both near and far zeros for your particular rifle, crossbow or shotgun. The Hawke 1×32 Multi Purpose Scope plays well with others. Crossbows, AR-15’s and shotguns to name a few. The left side-wheel operates the illuminated reticle. Both red and green illumination is available and each color offers five levels of brightness. The “crosses” illuminate – see the reticle image below for detail. The illumination feature is powered by a single CR2032 battery – available most anywhere. Just unscrew the reticle brightness control knob cap to replace the battery. 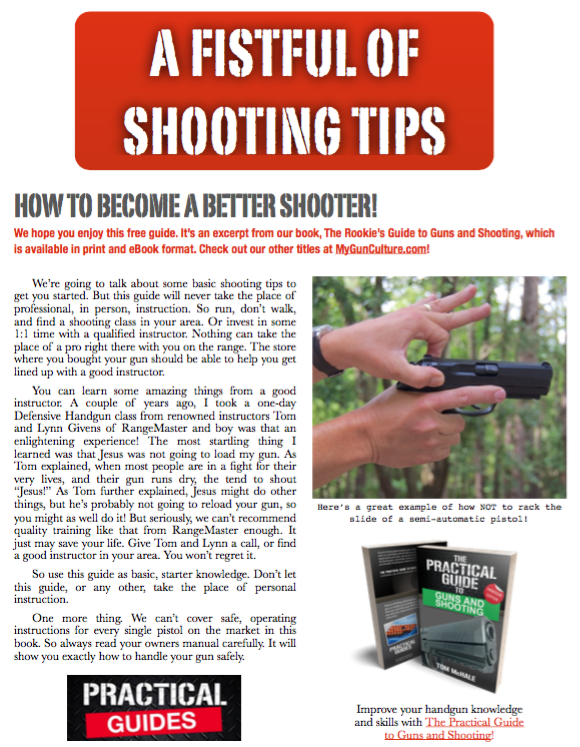 As this is a 1x optic, you’re probably not going to use the windage and elevation controls while shooting. They’re more for adjusting your zero as you change rifles and ammunition types. You might even move this to a crossbow! Each click adjusts the point of impact by 1/2 MOA, or just a hair over a half an inch at 100 yards. I found this to be plenty of granularity to get my favorite .223 load on target. The turrets are finger adjustable, and once you get your settings right, just screw the protective caps back on. Clarity of the scope was really good, with no discernible loss of focus or brightness as you look to the edges of the scope. The photo here shows a view at a berm about 110 yards away. The long horizontal and vertical bars made targeting fast and easy. Also as this photo shows, the cross aiming points show as black when illumination is not turned on. There’s really no need to use the illumination feature unless you’re in early or end of day low light conditions. One more thing – the top of the vertical bar is another aiming point – we’ll talk more about that below. Lenses are multi-coated and I found visibility to be good. While the objective is 32mm, the tube is 1 inch in diameter. Keeping this an all Hawke Optics solution, I used the Hawke 1″ 2-Piece, Reach Forward mounts. As you can see in the photo, this left quite a bit of remaining adjustment play both on the rail and in the scope rings. The eye relief in the Hawke Optics 1×32 Multi-Purpose scope is very generous so you can put this scope pretty much anywhere on the receiver rail. The specs indicate that eye relief is 8 inches. It’s not intended to be a scout scope so you’ll get some shadowing if you try to put it on the front rail. While testing, I placed the scope so the rear lens was about an inch forward of the rear of the receiver. This provided great visibility and unhindered access to the charging handle. 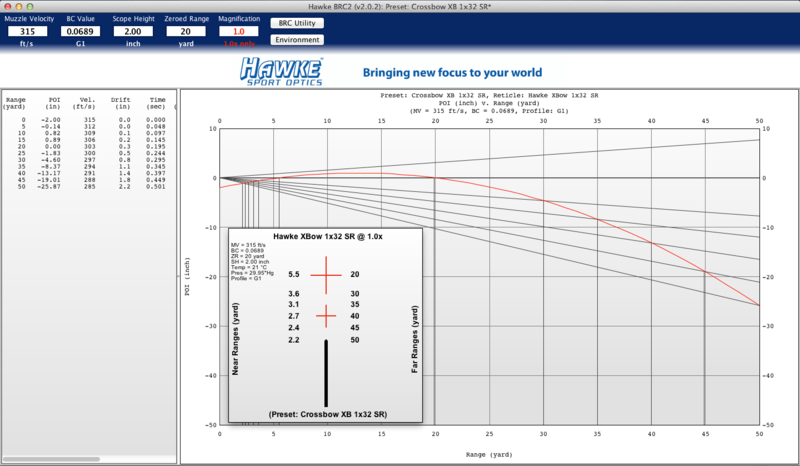 Hawke Optics offers free ballistics software for Mac, PC, iPhones and iPads and Android devices. The BRC software has the Hawke reticles and a bunch of cartridge profiles built-in, so you can quickly tell it you’re using the Hawke 1×32 Multi-Purpose scope with an AR-15. As I was using practice hand loads, I adjusted the actual velocity to 2,700 feet per second instead of the default 3,250. As this is a 1x optic, and I’m half blind, I chose a 200 yard zero. not to actually shoot at 200 yards, but because the “near” zero point for the primary aiming cross works out to 42.2 yards. You can see on the image here that the left columns shows near zero distances while the column on the right shows far zero distances. Using my specially calibrated tennis shoes, I paced off 42 yards and added a bit more. Sure enough, I was right on target with the primary (top) aiming point in the reticle. Here’s where it gets interesting. The Hawke BRC software tells me, that for this reticle, with my specific load and velocity, what the aiming points are for the lower cross and the top of the vertical post – 6.3 and 4.3 yards respectively. So I moved my target in to 6.3 yards, again using my Imperial system calibrated shoes and paced off 6.3 yards. Again, right on target. same with the top of the vertical post aim point at 4.3 yards. Depending on where you set your primary zero, and which load you use, you can develop a useful scenario where you know point of impact for both very short and very long-range. This is particularly handy with AR-15 applications. As the center of AR-15 optics is generally about 2.5 inches above the bore, you normally have to compensate for short-range shots. With the Hawke 1×32 Multi-Purpose scope, you simply use one of the lower two aiming points to put you right on target at “inside the home” distances. The Hawke 1×32 Multi-Purpose BRC software comes preloaded with all of the Hawke Optics reticles so you can easily work out point of aim and impact solutions. Here’s the data we used for AR-15 testing with a 2,700 foot per second .223 Remington load. The practical flexibility of this optic is just plain cool. I’ve been using it on an AR-15 with great success. My daughter just got a Barnett Jackal crossbow, so the weekend project will be to equip it with the Hawke 1×32 Multi-Purpose scope and see how that works. Our first step will be to configure the Hawke BRC software with the Jackal’s ballistic data. Here’s the initial report based on the bolt velocity of the Jackal. By the way, crossbow data is preloaded into Hawke BRC software and you can tweak variables like velocity. The Hawke BRC Software give us this projected aim point and range data for the Barnett Jackal crossbow. So, looking at the right column of far aim point data, we see that the three default aim points correspond to ranges of 20, 40 and 50 yards. I’d be remiss if I didn’t touch on the value of this one. Retailing at $129.99, the Hawke 1×32 Multi-Purpose scope is a great option to consider if you’re on a tight budget. Add the benefit of moving it around from rifle to crossbow to shotgun and you’ve got a winner.